So you took your credit card out and bought Kindle 2.0 as soon as it was released on Amazon. Big deal! You are just another Kindle adopter. But you know what would set you apart from other Kindle owners? A cool protective case that is almost as expensive as the device itself. 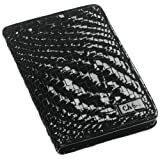 If you are looking to pimp your Kindle big time, Cole Haan is the way to go. The patent cases are more shiny, but there is no major other major difference between the above two categories. All these cases come with hand-stained, hand woven leather exterior and goat suede interior. I was very impressed about how lightweight these cases are. The case protects your device but doesn’t take away the convenience factor. And you get business card holders with all these cases. So if you are a super networker, you have one more excuse to take your Kindle with you. 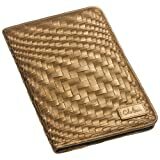 Cole Haan Hand-Woven Leather cases are stylish and expensive. If you are into fashion and want to dress up your Kindle, you are going to love your Cole Haan case (as long as you can afford it). Otherwise, you can always get one of those cheaper cases. They do work just fine. Previous story Facebook On Kindle?